You know how your favourite blogs are the ones that ooze the personality of the writer? It's the same for retail shops. I want a special experience, not a mass-produced, generic one. Walrus is such a place. Described as a contemporary lifestyle boutique, it's so much more than that. 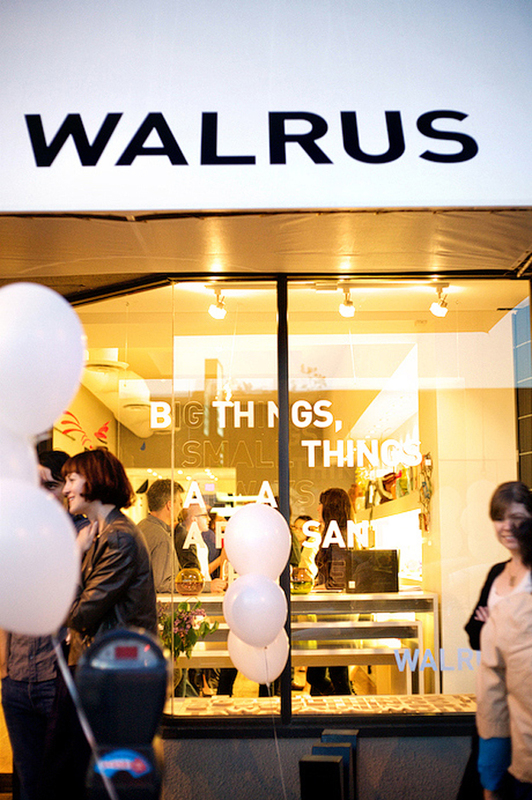 It's also a place for creatives and creatively curious to gather for their events where Walrus showcases local artists. And what intrigues ME is that they aren't just attracting the same design-y audience to their events - they are attracting people from all walks of life. It's this eclectic mix that makes for a great evening. I'm pleased to introduce Caroline Boquist and Daniel Kozlowski, owners of the styish Walrus as part of my Offroad Blogging series. Other interviews include photographer Justin Hackworth, Megan Gilger of the Fresh Exchange, Danielle Krysa (the Jealous Curator), Jen Cooper of Classic Play, Erin of Art Social and Gabriel, the Artful Desperado. But let's meet Caroline and Daniel. The goal of our events is to two fold. One, is to showcase the range of creative talent that comes out of Vancouver and two, is to build community. The events either happen over a weekend, during regular shop hours, or on a Wednesday or Thursday evening. We usually do about 4 – 6 a year and the work stays up for about 2 months. It’s important for us to keep the events different throughout the year, this way we can keep it fresh for our clients each time. So far they’ve ranged from gardening seminars, to jewellery trunk shows, to industrial design and everything in between! We think it’s important to go offline in order to have that human connection and interaction that can sometimes be amiss online only. The more digitally dependent we become, the more we have this internal need to connect with people in real life. In real life, there can be a spontaneous energy and dialogue that perhaps online wouldn’t translate in the same way. What was your biggest worry before starting your event? We always have butterflies before an event, but I guess that is normal. We always wonder if people will show up and thankfully, so far they have. We also worry if everything will come together, especially if we have an event with more than one artist. Organization before an event is key! Our space is tiny, so we clear all 5 middle tables, put as much product as we can on the other shelves and open the space up. It maximizes our space to accommodate as many people as we can comfortably. Why should people/bloggers come to your event? We think people should come because it’s fun! We’re so lucky to have met amazing people through the shop. It’s a great to way to see what local talent we have, meet new people, learn something new maybe, have a glass of wine, a good way to spend a weekday evening! If the artist/designer is happy, the people attending are happy, and everyone’s having a good time and enjoying the work being shown – then we think it’s a success. From idea to execution, how long does it take? It can range anywhere from 2 months to 10 months to execute. The organization can be challenging, the concept, and knowing what’s going to work. That spontaneous energy and dialogue - that's what attracts me to getting offline. It's why I love twitter - it's the closest to real life banter that you'll get. And organization being a key factor. So true! You wouldn't believe all of the little behind-the-scenes details. Whenever I'm at someone else's event, I take my hat off to all of the work that happened long before that evening. And during the evening too! Live in Vancouver? The next event at Walrus is on June 19th from 6-9pm where 6 of Vancouver's ceramicists will show their new creations. I'll be there - will you join me?